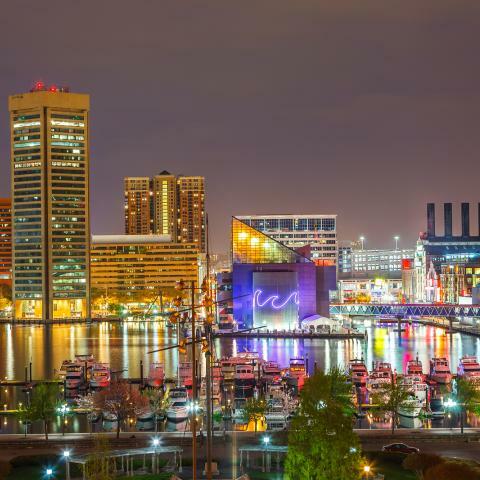 Baltimore is a popular tourist destination in Maryland, in the Mid-Atlantic region of the United States of America, near Washington, D.C. It is perhaps most famously known as the city where Francis Scott Key wrote the lyrics for the Star Spangled Banner, and today has become a major centre for tourism and travel. It lies on the juncture of the Chesapeake Bay. With continuous nightlife, temperate climate, and plenty of hospitality, any time of the year is a great time to visit. Source: Wikitravel. A list of contributors is available at the original article on Wikitravel. A wide variety of dining options can be found in Baltimore, but no visit to Maryland is complete without a sampling of the local favorite: steamed crabs! Though by and large the crabs no longer come from the Chesapeake Bay (they are shipped from North Carolina, Louisiana, and Texas due to overfishing of the Bay), it remains a popular summertime activity to spend the afternoon with family and friends at a crab feast. Often crabs are accompanied by steamed shrimp, corn on the cob, and beer. The market place, near the harbor, is full of fresh seafood and food bars. But for a more local experience, head to the neighborhoods surrounding it: Little Italy, Fells Point, Federal Hill, Canton, Mount Washington, etc. all feature both local and international cuisine. Canton Square offers a diverse selection of good restaurants, but one of the standouts is Nacho Mama's (2907 O'Donnell St). Fun atmosphere, good Mexican food, and many "priceless artifacts" representing everything Baltimore. There is also the must-see Greektown, which hosts a wealth of authentic Greek restaurants and coffeehouses. With unconventional museums and galleries, Baltimore is perhaps America’s most offbeat city. Welcome to the eccentricity capital of the East Coast.